Sarah Jane Marsh has taught American Revolution history in elementary and middle school. Like Thomas Paine, Sarah attempted several adventurous careers (zoo-keeping, dolphin training, and firefighting) before settling into writing. She has an MBA from the University of Vermont and lives with her family outside of Seattle. This is her first book. 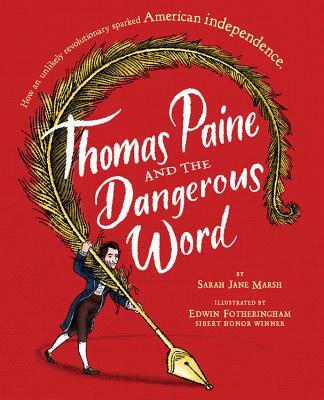 Learn more about Thomas Paine at www.sarahjanemarsh.com. Edwin Fotheringham grew up in Sydney, Australia, and attended the University of Washington School of Art in Seattle, where he currently lives. He began his career as an illustrator working on a variety of projects, from CD covers to Neiman Marcus print ads. Other clients include The New Yorker and The Wall Street Journal. Edwin has also illustrated a number of children's books, including Tony Baloney by Pam Muñoz Ryan and What to Do About Alice? by Barbara Kerley, which received the Robert F. Sibert Honor. See more of his work online at edfotheringham.com.